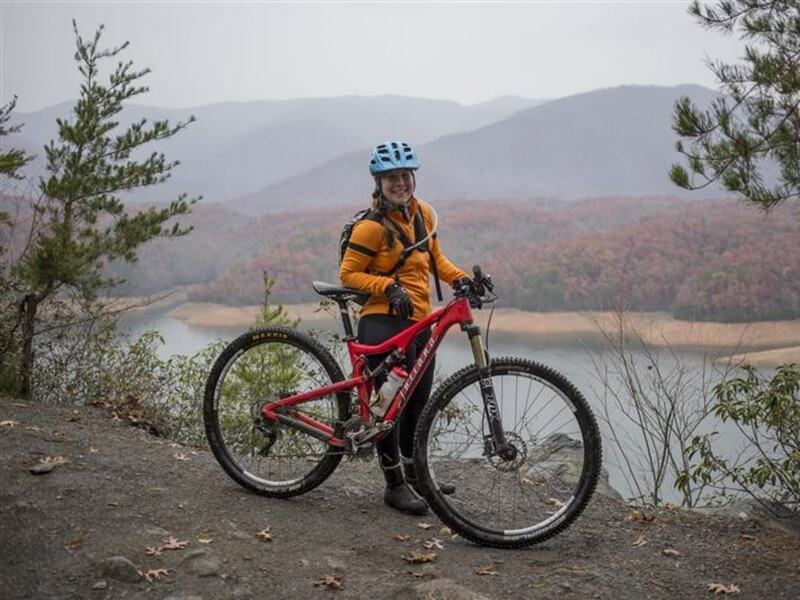 Some of the country's most epic mountain biking is carved into the steep hillsides surrounding Asheville. Fly down flowy, hard-packed singletrack, endure monster climbs, and plunge through hardwood forests on rock-studded roller coaster descents. You could spend a lifetime in the Appalachians and never run dry on huge riding adventures. Cycle shops like Liberty Bikes, Motion Makers, Youngblood Bicycles will keep you outfitted and your bike in tune. A massive and continual effort goes into the creation and upkeep of these hundreds of beautiful trail miles. Check out Pisgah Area Southern Off Road Biking Association (SORBA) to get involved. Mountain biking can be a highly dangerous sport, so make sure you are aware of your skill level and how it compares to the terrain. Now hit the trail and explore the incredible Blue Ridge wilderness in the most fun, fast, and epic way possible. The trails at Bent Creek are not directional and are very popular with hikers and dog walkers. Make sure and yield to foot traffic and climbing riders. Also bear in mind that this is an experimental forest whose primary focus is study and research, so be aware of signage, special regulations and off-limit trails. Park at the Hard Times, Rice Pinnacle, or Ledford Branch trailhead and enjoy your day exploring the web of intersecting trails and roads. We highly recommend a map! 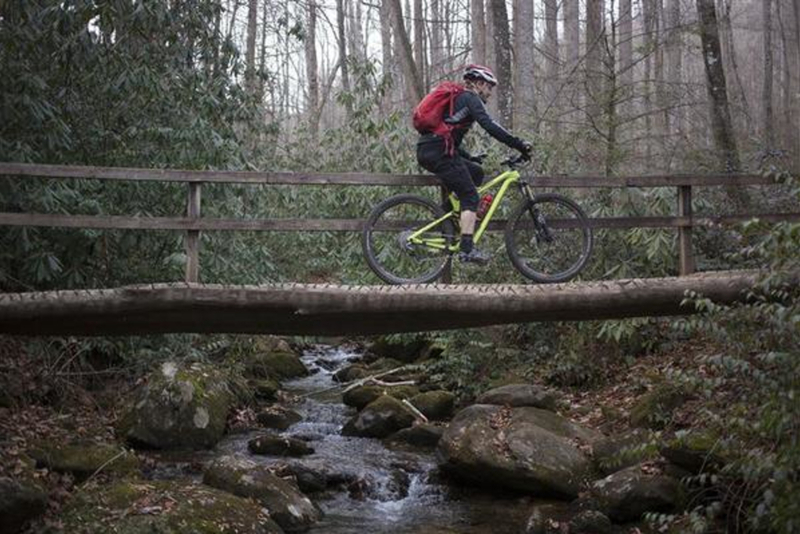 Just outside of Brevard, the voluminous, 500,000 acre Pisgah National Forest is a dream come true for gnar-loving mountain bike riders who don't flinch at steep climbs. Gnarled roots, rocks and huge ascents define the jarring terrain of this rugged shangri-la. While Pisgah's wild and technical rides are best suited for experienced riders, ambitious beginners can still pick out a few less intimidating loops such as the 4.6 mile North Slope Trail . 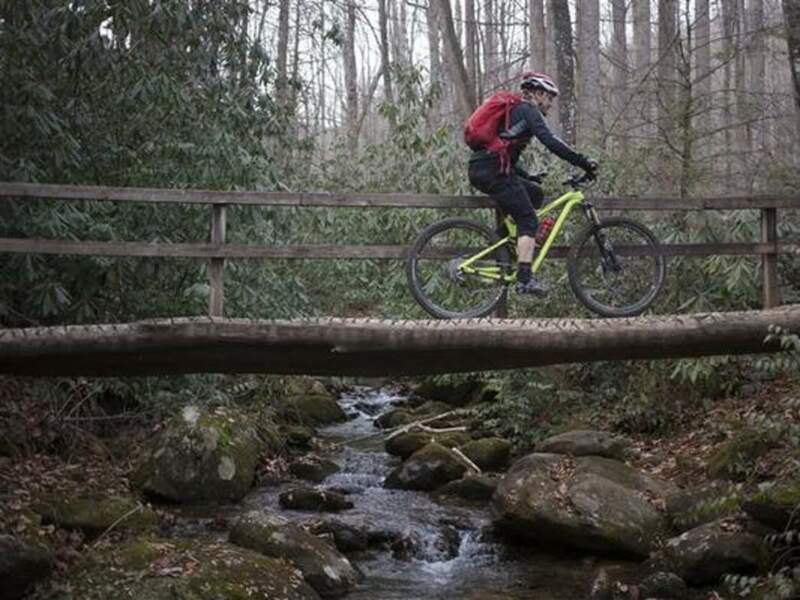 If you're just visiting, make sure and check out Black Mountain Trail, known locally as "Clawhammer," one of the most acclaimed trails on the East Coast. (Beginners, steer clear!) Other than that, there are too many quality runs and too much awesome and formidable terrain to even begin to describe. Stop by a nearby bike shop like The Hub or Sycamore Cycles for some local beta. While you will never find yourself short of trail miles in Pisgah, be aware of your surroundings. Certain trails are for foot traffic only, and some are only open to bikes during the less crowded winter season, Oct. 15- April 15th. The 10,000 acres of Dupont State Forest offers a grab-bag of the area's finest: narrow singletrack, massive berms, forest roads, punches of rock and root, and even a rare taste of Eastern slick rock. You may recognize this lush, densely forested landscape from the 2012 motion picture The Hunger Games . 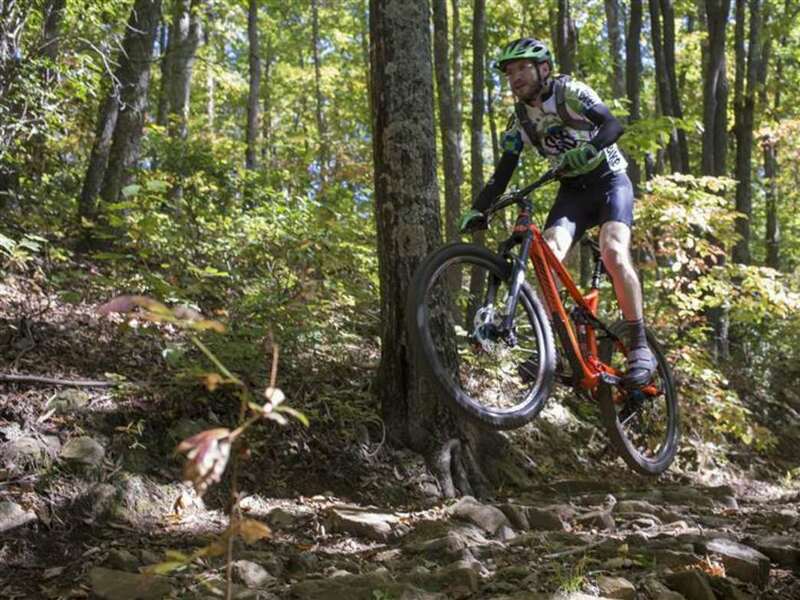 Over one hundred miles of multi-use trails punctuated by waterfalls and roaring creeks make Dupont one of the most popular mountain biking destinations in the Southeast. 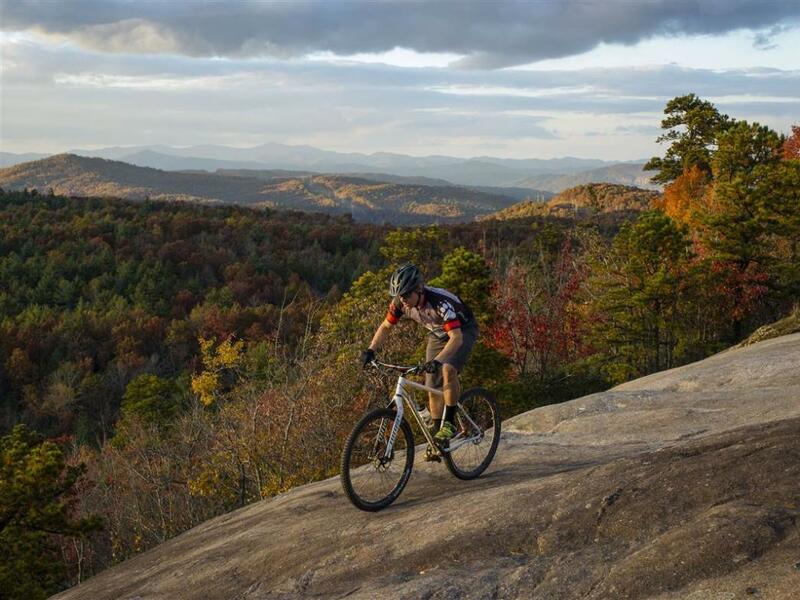 Two of the most famous rides in this forest are the 7-mile Ridgeline Loop and the 6-mile Slickrock Trail. Ridgeline includes some of the best, zipping downhill around, while Slickrock climbs over an exposed granite slab surrounded by panoramic views. Many of the other trails are short, one mile jaunts that loop and intersect, allowing you to link together any amount of miles you please on a given ride. Portions of these trails can be crowded during the summer months, with hikers and tourists exploring the waterfalls. Horse riding is also very popular; be aware that some horses might spook if you approach them without dismounting. Dupont closes at 10pm, so make sure and get your fill of turns before it's too late. The trail arrangement at Tsali is unique from the other popular biking spots in Western Carolina. The four trails etched into the shoreline of Lake Fontana are divided into into pairs. The pairs are open to mountain bikers on alternating days throughout the week. The nature of the terrain also makes this a standout destination. 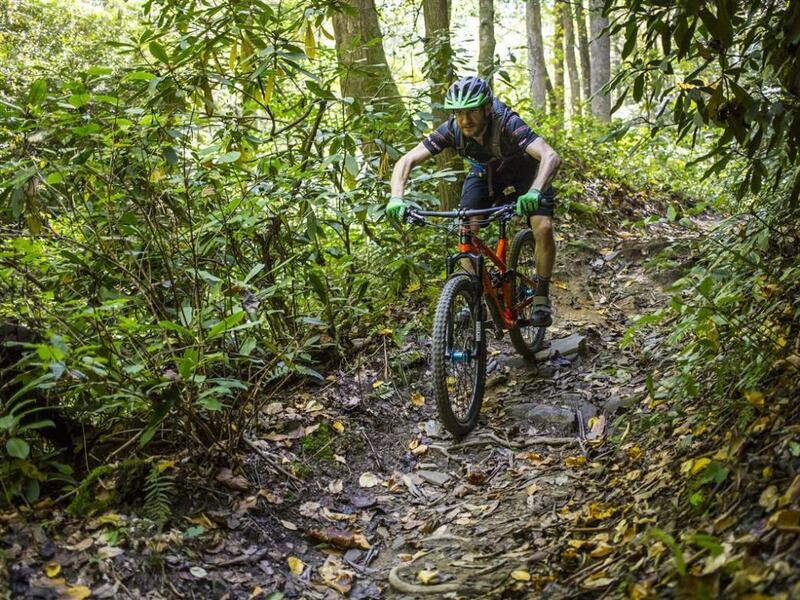 In an area full of big descents and rooted, rocky trails, Tsali's narrow single track flows smoothly through the Nantahala National Forest. Although there isn't much in terms of elevation gain (the climbs are punchy but short), the southern edge of the Great Smoky Mountains National Park across the lake provides a gorgeous and sustained view. If you can't spend multiple days here, determine what type of adventure you're up for and plan accordingly. For a total of 18 miles, the Left and Right Loops are considered to be the more epic of the trail pairs. The Left Loop in particular has a few narrow and precarious sections. If you're short on time, the Right Loop can be trimmed down to 4 miles by taking a connector trail. Mouse Branch Loop and Thompson Loop have a very different temperament. With only mild climbs and an abundance of roller coaster twists and turns, these trails are pure enjoyment. Kitsuma's prized descent is narrowly carved into a steep mountainside near Black Mountain, NC. This ten mile loop of single track will force you to earn your turns with a snarl of strenuous switchbacks. The 2,000 foot elevation gain can feel endless, but the downhill reward is fast and furious. 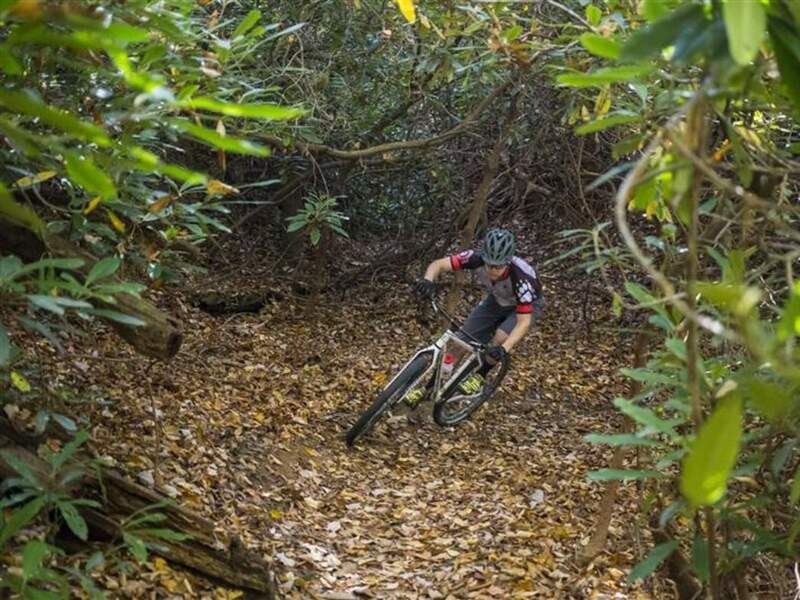 Water bars, steep gradient, grade reversals and sneaky switchbacks (as well as avoiding dogs and hikers) will keep you on your toes as you sling down one of Western North Carolina's most treasured trails. Just be careful- although it's not very technical, it's a long, steep tumble if you get ejected off your bike. Begin at the Kitsuma Peak trailhead on Royal Gorge road off of Interstate 40. The punch comes quickly on this one, but don't completely despair, as the trail becomes a bit more sane after the third switchback. You will a climb for a total of two miles before you reach the sweet, uninterrupted downhill.